I have, regrettably, been out of touch for a couple of weeks. This is due to another minor illness, which resulted in Bell’s Palsy. The good news is that it isn’t serious. Bell’s Palsy is nerve damage in the facial nerve, which causes paralysis on one side of the face. My left side is affected. Eating and drinking is challenging, and smiling is not happening. At least on my face – I’m smiling on the inside! This condition will resolve on its own, although I am on a course of Prednisone, a steroid, which will help stop any further nerve damage. I look forward to being able to stop that medication, as it has come with its own challenges and side effects. But I am grateful to have it as an option. This has been an interesting new adventure. It has made me really look at my own vanity. I work with the public in my “day job”, and I’ve had to really get over myself so that I can interact with them. I am totally fine, other than the paralysis. My brain is still sharp and I don’t feel sick. So there’s no reason I can’t go about my normal daily tasks. But I have been dealing with the fear of judgment and embarrassment. And you know what? Neither has happened. What a good reminder that we are all just pure energy, and whatever energy you put out, you will receive back. I am so grateful that this happened, because it has forced me to return inward, and focus on what I am choosing to do with my time on this earth, regardless of what others might think. Since I am otherwise completely healthy, I am able to see the humorous side of this ailment. It is temporary – maybe weeks, maybe months, nobody can say. But facial movement will return. And in the meantime, I can practice not worrying about what others think. I mean, I’m forced to practice not worrying about it. Because some people probably do fear or judge me when they see me or hear me speak. But that is about them, not me. I am the same as I’ve always been, just not as smiley. Sometimes our biggest challenges are our best teachers. Some of my hardest hardships have taught me the most and catapulted me further into my own self-improvement. How fortunate for me to have these issues come into my life. It helps me be a better me, and helps me relate to others in a deeper way. 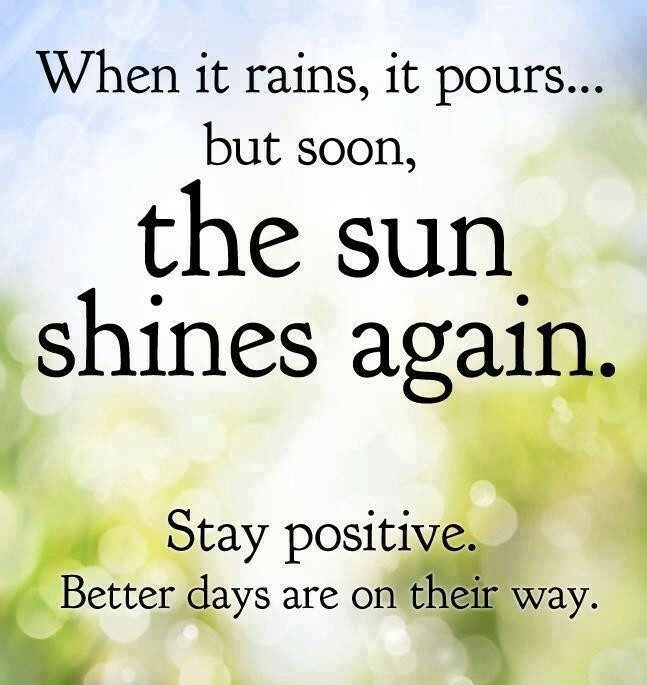 And just as the photo says, the sun always shines again! What challenges have you faced that forced you to grow in unexpected ways? I’m so eager to hear from you and share your experiences!